3. Don’t bury your lead. (Yes, I know it’s lede. Hang with me.) 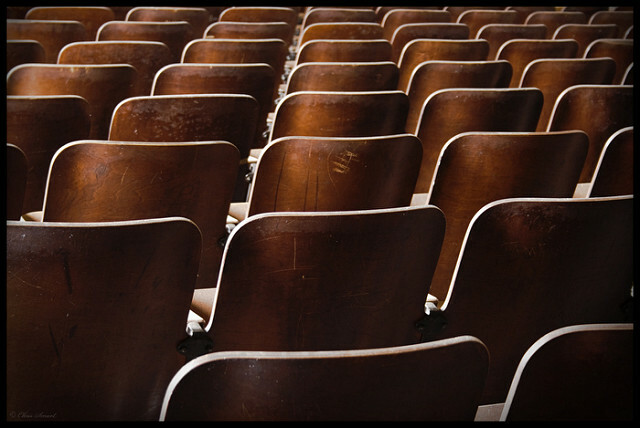 Too often, the first seating team member a guest sees is shoved 40 feet into a darkened auditorium. The guest doesn’t know who they are, what they’re for, or even that they’re there. Move your first person closer to the door, see them before they see you, and be proactive in beginning the seating process. 4. Know where your open seats are. I’m amazed (can I say appalled?) whenever I see a seater walk a group of guests to a certain section, only to pause, look bewildered, scratch their head, and backtrack to another section. Never attempt to lead someone if the destination isn’t clear in your mind. That’s good counsel for life and for seating. 5. Assume you know what’s best. You’ve been on this seating team for four years. You know the sections that fill first. You know where there are still a few good seats. You know where you need to lead people because you have the 30,000 foot view. Be confident. They’ll sense it. 6. Don’t assume you know what’s best. Sometimes guests are meeting someone in the service, and they know there are seats being held for them. A mom may have just dropped her infant off in the nursery for the first time, and she wants to sit in the back in case she needs to make a quick escape. It never hurts to ask for preferences. 7. Master the handoff. Your seating team should never function like the book of Judges, where every man does what is right in his own eyes. Know the Walkers, the Placers, the Counters, the Rope-Droppers. Whatever your individual roles are, all members of the team should be like fingers on a hand. 8. Let the ebb and flow of the service inform you. Don’t seat during a meditative moment or a video where the auditorium is dark. Walk people in during a meet and greet time, or during a worship song where everyone is standing. Share your service order with your team in advance so they’ll know which times are off limits to walk people in. 10. Approach seating from a heart of service. If you are on a seating team because you have self-esteem issues and you want to be on a power trip, you’ve already lost. We seat people because we want to treat people with genuine hospitality. We should view our role as 20% logistical and 80% loving. Smile at your guests. Welcome them. Learn their names and use them often. Explain that you’re there to help. Make them look forward to seeing you rather than dreading the Seating Bully.